When you leave a group, you give up your access to the group inbox, calendar, OneNote notebook, and library. The only way to regain access is to rejoin the group. When you stop following a group, you are still a member but no longer receive all group conversations in your personal inbox. Instead, you'll only receive replies to your posts, messages where you're mentioned, and events in your personal inbox. For all other group conversations, you'll have to go to the group inbox to see them. 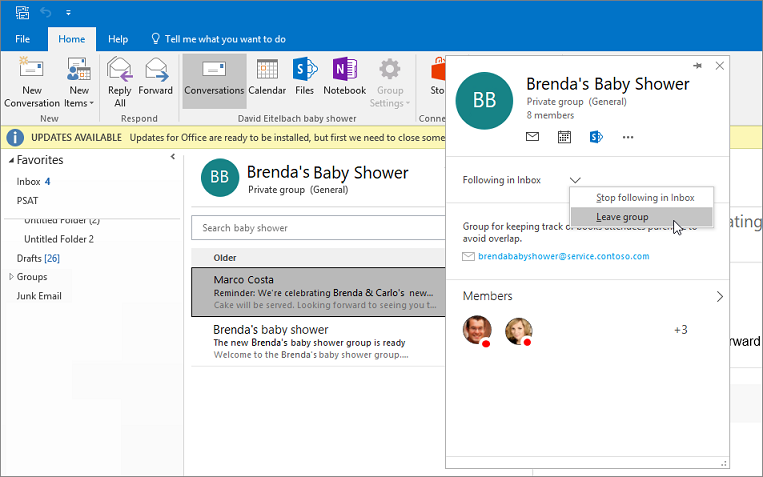 See Follow a group in Outlook for details. At the top of the page, select > Leave group. You'll no longer be a part of the group and won't be able to access the files or other data. As a guest, you receive all group conversations in your inbox; you don't have a group mailbox in your email client. In every email conversation you'll see a message with a link to leave the group. Select Leave Group. You'll receive a message asking you to confirm that you want to leave. Once you confirm, you'll receive an email that includes a link to rejoin. Clicking the link will send a request to the group owner. In the folder list, select a group that you're a member of. Click the name of the group and then click the down arrow next to Following or Not Following. Select Leave group. You'll no longer be a part of the group and won't be able to access the files or other data. 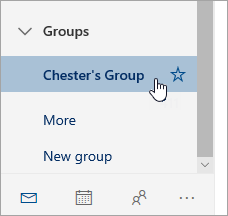 For instructions about leaving a group in Outlook mobile, see Use Groups in the Outlook mobile app.